A century of butchery, shown in one bloody kitchen: shocking, but all too appropriate. So how do you take an entire century’s worth of war casualties — 38 million deaths over 25 conflicts — and cut through that mental fog? If you’re Clara Kayser-Bril, Nicolas Kayser-Bril and Marion Kotlarski, you festoon a cute kitchen with liters and liters of blood: one liter for every million deaths, to be exact. 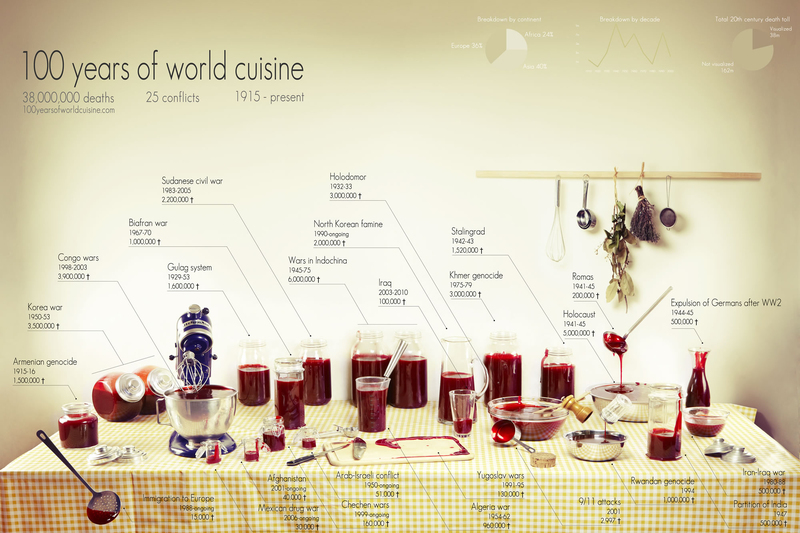 Before you gag on your lunch, rest assured that all that blood in this horrifying infographic, called 100 Years of World Cuisine, is as fake as the stuff in slasher movies. Indeed, the image is a kind of slasher pic all its own, except uncomfortably real: you can take in all the loss of life at a glance, or zoom in for individual snapshots of specific atrocities. (The mixing bowl holding almost four liters of blood, a shiny whisk poised menacingly above it — representing 3.9 million deaths in the Congo wars — is particularly unsettling.) Either way, you’ll never see these statistics the same way again. Kotlarski and her friends culled the figures from reputable sources, all linked on their site. But why a kitchen? “Our kitchens are the heart of our homes, [and] when we follow a recipe, it’s the moment when we least expect violence to arise,” Kotlarski tells Co.Design. “It’s unremarkable, banal, a daily task. By setting the photography in a kitchen we wanted to emphasize the absurdity of war. Has it [become just as] unremarkable if you’re not on the battlefield?” Looking at these mason jars full of gore, tidily lined up on a tasteful checked tablecloth like artisanal fruit preserves, one has to guiltily admit: yes. But it shouldn’t be, and visualizations like this can help bridge that terrible moral gap.